Matt Crafton, driver of the No. 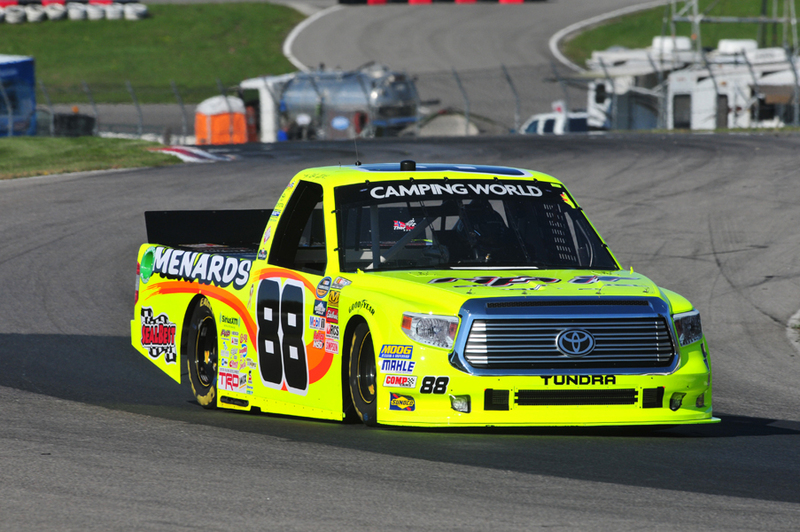 88 Rip It/Menards Toyota Tundra, made his fourth career NASCAR Camping World Truck Series (NCWTS) start at Canadian Tire Motorsports Park (CTMP) on Sunday. Starting from the rear of the 32-truck field, due to a transmission change following qualifying, Crafton showed speed throughout the 66-lap event. As one of four drivers that have competed in all four races at CTMP, the series veteran worked his way into the lead by lap 32, led the field for four laps, and finished fourth. The solid run was the Menards driver’s second top-five, and fourth top-10 finish at the 2.459-mile road course. Starting from the rear of the 32-truck field, Crafton wasted no time making his way through traffic in Sunday’s 4th Annual NCWTS event at CTMP. Throughout the race, crew chief Carl “Junior” Joiner radioed in to the two-time Champion, numerous times, that he was the fastest truck on the track. With pit strategy at a premium during a road course event, Joiner brought the No. 88 machine to pit road under the races first caution, at lap nine, for two tires and fuel, and under green at lap 36 for four tires and fuel. In the races final 30 laps, Crafton worked his way into the top-10 by lap 40, dodged a spin by a truck in front of him on lap 48, and contended for the race win in the final laps of the overtime event. In what was a dramatic, green-white-checker flag finish, the ThorSport Racing driver crossed the stripe in the fourth positon behind race winner, John Hunter Nemechek. The NASCAR Camping World Truck Series (NCWTS) had two practice sessions on Saturday in preparation for Sunday’s event at Canadian Tire Motorsports Park (CTMP). Matt Crafton was 13th, and 10th, respectively, in both sessions. The ThorSport Racing driver qualified 17th for the 4th Annual event at CTMP, but following qualifying, the No. 88 Menards team changed a transmission, forcing the veteran driver to start in the rear of the 32-truck field. Making his fourth NCWTS start at CTMP, Crafton started from the rear of the field, led the field once for four laps, and finished fourth, his second top-five finish at the 2.459-mile road course. In four starts at CTMP, Crafton has led the field for five laps en route to two top-five, and four top-10 finishes. In 15 starts in 2016, Crafton has one pole (Atlanta), two wins, and has led 421 laps en route to five top-five, and 11 top-10 finishes. In 376 career NCWTS starts, Crafton has earned 12 poles, led 2110 laps en route to 13 wins, 94 top-five and 221 top-10 finishes. Crafton’s ThorSport Racing teammates finished ninth (Hayley), 27th (Abreu), and 30th (Rhodes).